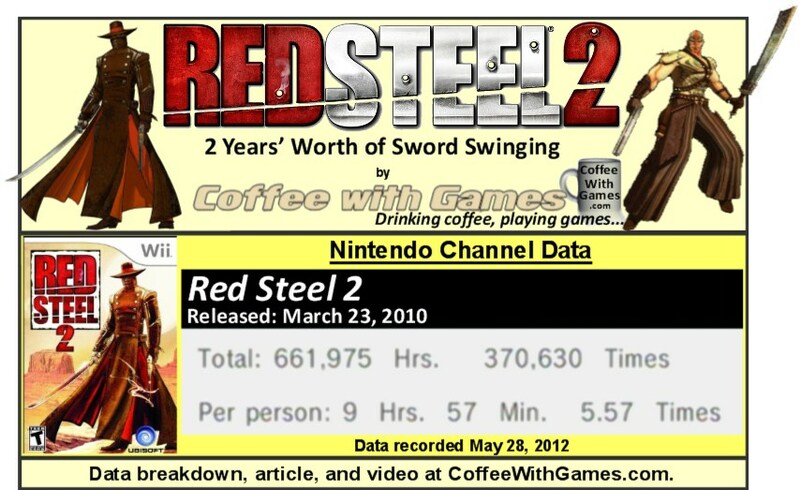 Coffee With Games: Did Wii Owners Enjoy Red Steel 2? What Do the Hours Say? Did Wii Owners Enjoy Red Steel 2? What Do the Hours Say? Red Steel 2 has been out on the Wii for more than 2 years now. It was developed by Ubisoft's Paris studio, and published by Ubisoft. The game did have at least one U.S. commercial for advertising (I think maybe even two), and the game released with two versions being available for purchase. One was the software only version for $49.99, and the second version was $59.99 and included a Wii MotionPlus unit which is required to play the game. Both versions have seen big price drops since they released, like most games do. The software only version can now be found for under $20 where available, and the Wii MotionPlus bundled version, while harder to find directly from retailers, can be found for around $30. Did Wii owners enjoy Red Steel 2? What do the reported game-play hours for the game show, and can we draw any conclusions? Let's take a look! Red Steel 2 now has approximately 66,540 U.S. Wii owners that have reported game-play data with 797 days possibly reported, which is 21,951 more players having reported data since March 28, 2011. Red Steel 2's 661,975 Total Hours of reported game-play is an increase of 232,950 Total Hours since last year's report, and the game's average play-time per day/session is now 1 Hour 47 Minutes. The game's "professional" review score average has not changed since last year, and remains at 80.62% based on 47 reviews on GameRankings.com. Red Steel 2's customer review score average on Amazon.com has changed though, and there are now 18 more customer reviews than last year. The customer review score average is now 87.53%, based on 77 customer reviews between both versions of the game listed. So, did Wii owners enjoy Red Steel 2, and can we conclude anything from the reported game-play data with another year added to it? I think we can safely say from the reported game-play data, mainly the game's average play-time reported as 9 Hours 57 Minutes "Per person", it appears that the majority of Wii owners still enjoy the game enough to complete it once, but are not beating it a second time. If the U.S. Red Steel 2 players were beating the game at least twice, I would expect the reported hours "Per person" to be averaged more around "15 Hours", as some of you have commented in the past the game offers about 10 hours of game-play on the first play-through. Perhaps Red Steel 2 has more hours averaged in other countries, showing it is played more often in those countries, and Dexter might be dropping Canada's reported hours in the comments below that we can look at. Have I played Red Steel 2 yet? No, but I may be making a trip to my local Game Stop store today, where I originally reserved Red Steel 2. I believe I still have $5 on the game and I might just pick it up today, only a few years late. After all, better late than never though, right? If I can get around 10 hours of game-play out of it for around/under $20, and enjoy the Wii MotionPlus controls, I think that's a pretty good deal. If I end up getting Red Steel 2 today, or not, I will make it known in the comment section below. Did any of you perhaps get Red Steel 2 in the last year, and beat it? If so, do you remember about how many hours it took you from start to finish? If you purchased Red Steel 2 soon after it released, and would recommend it to other Wii owners, have you completed the game more than once by now? I think we've had a Red Steel 1 and 2 discussion before, can't recall. I missed out on the first, really enjoyed the second. I beat it in about nine hours if memory serves me right, but never bothered with a 2nd play-through. I thought it was a really clever game in terms of mechanics. I just hope I'm right, and my $5 is still on it! Not my kind of game, unfortunately. That and I don't have a Motion Plus myself - I played Skyward Sword on my brother's Wii over Christmas and nothing else made Motion Plus worthwhile to me. I wonder if Ubi will try for a third on Wii U. So, did Red Steel 2 leave the store with me today? That is such a fun game! I thoroughly enjoyed the whole experience. I really liked the art style. $5 credit, what $5?! No, so either I was wrong and used it on another game, or it vanished into the CEO's pocket. I would guess the second. If Ubi tries for a third, I really hope they return to the original's setting and mechanics, then again, I enjoy FPS games a good deal and don't see many developers using Wii MotionPlus as the ONLY way to play games on the Wii U. This is the first game I purchased that REQUIRED it to play. We never bought Wii Sports Resort, and no Skyward Sword either. Though, I do have Rage of the Gladiator which gives you the choice to use it as a control method, which I thought was great. Just from my short time with the game last night, the art style is excellent. "Plus, the fact that there is no blood is good for kids." You know, I remember when games gave options for blood/no blood and I believe Mortal Kombat even did the "green blood" option. Thanks for the posting the story, and glad you enjoyed it! Also, I was going to contact you Friday, June 1st, but do you still have the coffee supply? I bought it last year when it became dirt cheap, I played it for about an hour before it got too annoying to play. The deal-breaker for me was the narrow field of vision. It feels like I'm constantly playing the game zoomed in with a weapon and makes the whole experience feel claustrophobic. I haven't seen a game this bad since the original Turok. Well, I got it for dirt cheap yesterday, and I've only played it about 30 minutes, so I'm just getting started...enjoying the art style a lot, but not sure on the combat. I'm hoping I get used to it, and it starts flowing more naturally for me once I learn the moves and just get used to the combat system. "I haven't seen a game this bad since the original Turok." I loved Red Steel 2. I heard a lot of bad stuff about the first game, but was excited about the total overhaul the game got for the sequel. I picked it up last year for $20 (With Wii Motion+), and enjoyed it thoroughly. I did feel like the game got bland sometimes, but the style of the game is just so interesting. I hope they do a sequel and expand on the game like Assassin's Creed 2 did to Assassin's Creed. "I heard a lot of bad stuff about the first game..."
So did I, and I went into playing the original as a big skeptic, but had a lot more fun with it than I was expecting. It could be because I didn't really experience any of the cursor issues that people talk about with it, but I have beat the original at least twice now, and enjoyed it both times. I just started playing Red Steel 2 last night, and the art style was a great choice I think, and I'm hoping I enjoy the full game. As for, "I hope they do a sequel and expand on the game like Assassin's Creed 2 did to Assassin's Creed." I've only played the original Assassin's Creed, which I have heard (and can admit) can be overly repetitive with how the missions are played out. Not very much variety I guess. I have heard, perhaps like what you're suggesting, that Assassin's Creed 2 made some major improvements to the mission structure, and it made the sequel better than the original. The decision to make Red Steel 2 in a totally different setting/time frame though, was an odd decision I believe. Hopefully my opinion changes as I play through it some more. I played it a lot, but I don't think I ever finished it though. I'm not saying that Turok was a bad game by any means for its time, but the cramped view will definitely be noticeable if you go back and try to play it now. It's comparable to trying to play a modern FPS by viewing the whole game through iron sights. I never played the N64 version; I don't know if it was different (for better or worse). I believe EB Games is selling this for less than 10 bucks, and now that I have motion plus I may have to get this as well. No, the 48 hours rule I believe is to hold the reservation for 48 hours, but not the $5. Usually the $5 sticks around for at least a few months, and they even send out a few text messages as reminders of the credit. So, you have 48 hours that they will honor the reservation (say it's a game in high demand), but if you don't go pick it up within 48 hours, they can/will sell your copy to somebody else even if you have it reserved. "Wow so much hate for one of the best games released for Wii." "I suggest reading about how to setup your controller correctly for FPS games on Wii." I'm familiar with the Wii FPS controls, and actually would prefer if I could use Wii Remote and Nunchuk controls in most FPS games I play, though I started playing a FPS today on my PC for the first time in a very long time. I have only played Red Steel 2 for 30 minutes (29 actually, if we use the Nintendo Channel's data), so I'm not even very far into the game. "Once u level your character up and learn all the swords moves you become an unstoppable killing machine. It also has one of the best soundtracks"
I have heard about the leveling up in the game, and I know some viewed it as being too easy because of that system, but I'll find out for myself soon enough. As for the soundtrack, Ubisoft does seem to put out some really good soundtracks in their games. Thanks for the comment and feedback, and joining the conversation! "Actually I enjoyed Turok too, partly because it was one of the first game I played that really took advantage of my shiny new 3DFX Voodoo 2 graphics card. :D"
Haha! In the 90s, mid-late, we still had the green screen computer...but one of my friends had a more "modern" (for its time) PC that could run games pretty well. "It's comparable to trying to play a modern FPS by viewing the whole game through iron sights." Yea, I'm not very far into the game, but I know what you're talking about with a narrower field of view...it's like the camera is pushed UP, and not drawn back. Kind of interesting, as platforming games do a lot of crazy stuff with cameras. I think New Super Mario Bros. Wii had a great camera position in general, just the right spot....whereas I thought Donkey Kong Country Returns and Rayman Origins had their "camera" positions too far back. Not terrible, and perhaps on an HD tv DKCR and Rayman Origins would look better, but the field of view sometimes required getting up closer to the tv to try and track all the crazy stuff happening. Thanks for checking back in with the feedback! I'm guessing there's no possibility to zoom on the Wii / PS3 / 360 versions? "I'm guessing there's no possibility to zoom on the Wii / PS3 / 360 versions?" Nope, unless I'm missing it. I even read the instruction manual, and didn't see where it listed a "zoom" feature of any sort. "I think I played DKCR on my projector with a screen of about 120", so I don't recall having any problems with that one either. :)"
Yea, I guess when Donkey Kong is about 2 feet tall, the camera position wouldn't be that much of a problem! Haha, that's awesome. Speaking of the Vita, which version do you have? WiFi only, or 3G? I watched the videos and didn't realize there was that much FPS action. I thought it was all swordplay or something like that. Oh and those explosions: freaking awesome especially with the end-over-end flying cardboard bodies. "I watched the videos and didn't realize there was that much FPS action." The original Red Steel was more FPS action, with a few sword battles scattered throughout. "Hm, may have to pick this up if I spot an incredible deal somewhere. I'm pretty sure I have two WM+ attachments and it is a shame that it wasn't utilized very much." Just making sure you know the videos above, show off game-play footage from the ORIGINAL Red Steel. Red Steel 2 requires WM+, not the original. Ah, I wasn't paying close attention. Though after watching a few RS2 reviews I have to say that it looks pretty awesome. Graphics look very good and so does the gameplay. This just moved way up on my list and it doesn't hurt that it's readily available for less than $20. I got the WiFi only. 3G signal is pretty spotty anyway on most of my daily commute, so I figured it wouldn't be worth having it right now. "I got the WiFi only..."
Yea, if I got one, it would probably be the WiFi only version...just because I'm not out of the house that much, and most places we go to visit have WiFi already. "Ah, I wasn't paying close attention." You should! As for RS2, I'm making good progress in it, a pretty good ways into the game I think. Tough room I tell ya. Cool to hear about RS2. Might be buying it soon enough. "Tough room I tell ya." Was trying to make a hat/bowl of soup joke, but couldn't fit it in. It might be July, may know more later this week.